Alan Pearson was born in Upper Norwood, Surrey around 1898. He was the son of Harry and Elizabeth Pearson. His father was born in Great Waldingfield, Suffolk but had moved to Penge in Surrey by 1881 where he was described as a ‘Clothier and Outfitter’. His mother was born in Assington. Alan had three half brothers Harry, Frederick and William and a half sister Florence from his father’s first marriage. The family lived in Upper Norwood before returning to Suffolk to live at ‘Woodruff’, Vicarage Road in Great Cornard. Alan enlisted at Somerset House in the Strand, London formerly as 4926 London Regiment. The London Regiment was considered at the time to be ‘an elite Territorial Regiment’. In August 1914 the 1st/15th Battalion was part of the 4th London Brigade, 2nd London Division. The battalion landed in France between 9th and 22nd March 1915 and by May had become part of 140th (4th London) Brigade, the 47th (2nd London) Division. The Division saw action during the Battle of Aubers Ridge (9th May 1915) and the Battle of Festubert (15th – 25th May 1915). Later that year it took part in the Battle of Loos (25th September – 19th October). Alan was killed in action 22nd December 1916. 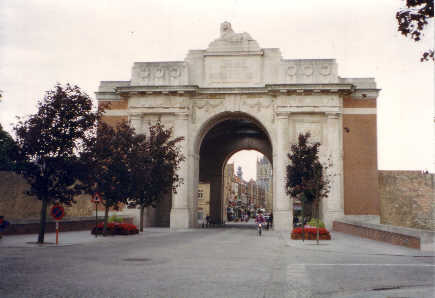 There is no known grave and he is remembered on the Menin Gate, Yprés, Belgium. His father had lost two sons in less than six months. Six months later he would lose a third. Alan was awarded the British War Medal and Victory Medal. A Cross of Remembrance laid at the Menin Gate Memorial on 15th April 2006.